REDKEN PRE OIL DETOX SHAMPOO 300ML – HAIRDEPOT - Hair & Scalp Care Products, Prevent Hair Loss, Shampoo, Conditioner, Treatment, Styling, Appliances and more! Get your hair into rehab! 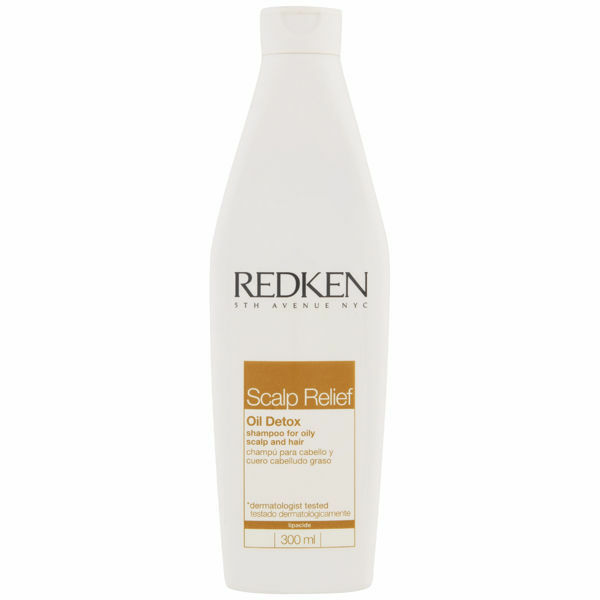 The Redken Scalp Relief Oil Detox Shampoo cleanses the hair and the scalp gently while it soothes and provides you with the relief you are craving. Infuse your hair and your scalp with moisturisers that nourish and replenish. Redken takes advantage of its science heritage with advanced, high-dose, salon-recommended home scalp care products for lasting scalp solutions. Specialized Lipa-Sponge System = instantly absorbs, purifies and protects against excessive oil caused by overactive sebum production. This formula utilises the advanced Lipo-Sponge System technology combining lipacide to rebalance pH level, micro-sponges and lemon extract. Thoroughly cleanses pores, absorbs excess oil and purifies the scalp. Rebalances scalp to its natural moisture equilibrium, while mattifying and controlling oil. For daily oil control, massage into wet hair and scalp. Rinse. For more intense treatment, apply before wetting. Leave 1 to 2 minutes. Wet hair, lather and rinse. Can be used daily.